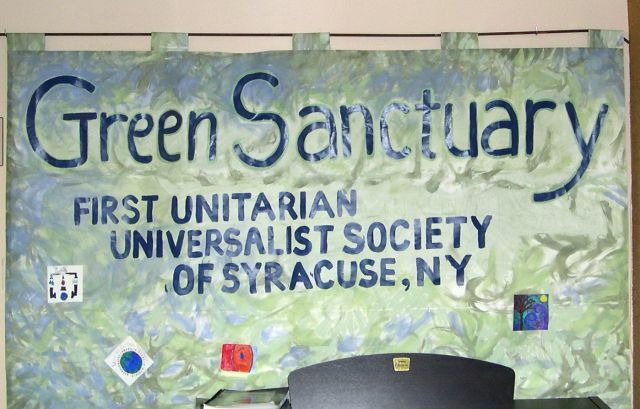 In May, 2011 First UU’s Green Sanctuary received notification from UUA’s Office of Congregational Stewardship Services that we will be recognized as an Accredited Green Sanctuary! We believe that the Earth is in peril from human activities, and for us as people of faith, this is a moral and spiritual crisis of utmost importance. Click hereto find out more about our EARTH STEWARDSHIP COMMITMENT.”We could have saved the Earth but we were too damned cheap.” ~Kurt Vonnegut, Jr.
MISSION STATEMENT The purpose of the Green Sanctuary Committee is to lead the congregation in its goal to obtain Green Sanctuary certification by identifying environmental concerns and opportunities within our building, community and the world at large, and by establishing special projects and ongoing activities that allow the congregation to address these concerns and opportunities. 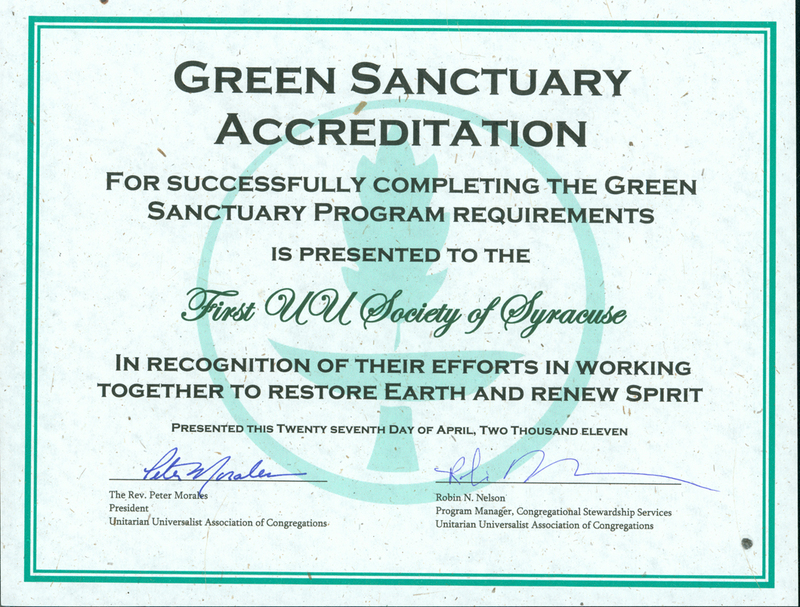 Green Sanctuary Certification is granted by the UUA Ministry for Earth in order to support congregational efforts to affirm and support our 7th principle: “Respect for the interdependent web of all existence of which we are a part.” The Green Certification process includes projects within our congregation and in partnership with other local, and possibly national or worldwide, congregations and community organizations. GREEN SANCTUARY DOCUMENTS We have the following documents available for review. You will need Adobe’s PDF Reader to view them. (Click here to download it). COMMITTEE MEMBERS The following people are members of the Green Sanctuary Committee. Please feel free to contact them if you want more information regarding the Green Sanctuary or living a sustainable eco-friendly lifestyle. Hydrofracking: The Green Sanctuary Team has shared information with the congregation about climate change and about the value of water. The possibility of hydraulic fracturing for natural gas in New York State presents a very real environmental and human threat. The problems include contaminated drinking water, respiratory and other health effects, soil contamination, extreme disruption from construction and extraction, use of high volumes of fresh water, and additional demands for local public services. Accidental release of methane, a greenhouse gas, into the atmosphere from hydrofracking wells and pipelines increases global warming. In 1995 Congress exempted such releases from the Clean Air Act of 1990. 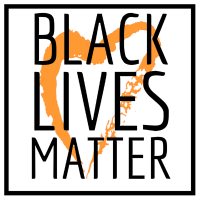 “As Unitarian Universalists, we respect the interdependent web of all existence of which we are all a part.” After study, we realize that, using existing technologies and practices, hydraulic fracturing presents an unacceptable threat to the environment and public health. Therefore, we support a ban in New York State on hydraulic fracturing to obtain natural gas from deep underground. At the national level, we support regulating hydraulic fracturing to protect the environment and public health in states where this practice is permitted. Since 1994, The Green Guide has been the premiere consumer source for practical everyday actions benefiting environmental and personal health. The Green Guide is brief and focused, an information destination with all facts rigorously researched and verified. Click here to learn more. Compact Fluorescent Lights (CFLs)- 90% of the electricity that runs an incandescent light bulb makes heat, not light. CFLs cost more than incandescent bulbs up front, but are four times more efficient and last at least seven times longer. Using an 18-watt CFL instead of a 60-watt incandescent bulb will prevent about a ton of CO2 emitted by coal plants from entering our atmosphere over the lamp’s 8 to 10 year life (source: global warming poster series; www.muusja.org). You can learn more here. Conserve Gas – Over a year, driving an SUV instead of a car wastes more energy than leaving your refrigerator door open for 6 years, or bathroom light burning for 30 years, or color TV on for 28 years. If every car in the United States carried one more passenger on its daily commute, 32 million gallons of gasoline would be saved each day. For a multiplier effect, use mass transit (source: global warming poster series; www.muusja.org). Recycling – Americans throw away 25,000,000 plastic beverage bottles every hour. Americans throw away 25,000,000,000 styrofoam coffee cups every year that will never be recycled. Recycling creates 36 jobs per 10,000 tons of material recycled compared to 6 jobs for every 10,000 tons treated as garbage. Turning recyclable wastes into reusable materials can save from 70% to 90% of the energy required to make the originals (source: global warming poster series; www.muusja.org). Click here for the world’s shortest recycling guide.